So after 18 months i finally got round to soldering all my loom and mosfet back together and gearbox back into the gun. Safe is safe and working well. But in semi its just continually turning the motor making a horrid screeching. Stops in safe and full. Nb this gb has external contacts on the selector plate which i havent used before so know nothing about. Also what is a realistic life span for just traditional trigger contacts and a 7.4 lipo? If its screeching its either shimmed to tight or your motor height is a bit low. Both can be worse in semi than in full don't know for sure why. if it was screeching or making any noise in "Safe" i'd be very worried!!!! try loosening the gear box screws a 1/4 to 1/2 turn, that'll tell you if it is shimmed too tight. Guys the screetching is irrelevent for now its the continually turning without tpuching the trigger thats the issue. your cut off lever is either misaligned or broken. Best guess is Mosfet is shagged its letting the power through without you hitting the trigger. Is it programmable and which mosfet is it? Could be, its difficult to call without having it in front of you though. Op does it start turning soon as it goes into semi or only after the trigger pull? 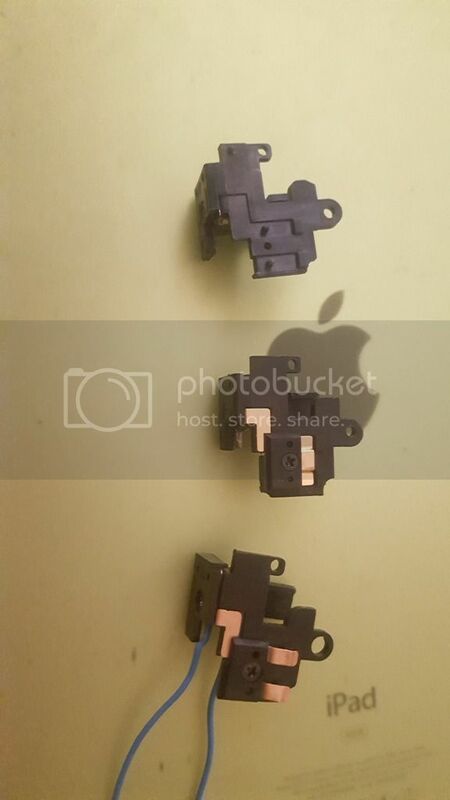 just out of curiosity, the trigger return spring is still working? Or the mosfet is dead. ok so brand new standard wiring loom installed (Dis one) Still the same issue. that's three different looms, three different trigger blocks and 2 mosfets, all replicating the same problem. safe = no trigger pull, no firing. semi = constant full auto firing without touching the trigger, no change on trigger pull. auto = normal operation, motor on with trigger motor off when released. if i bridge the top pin with the selector plate contact = nothing. 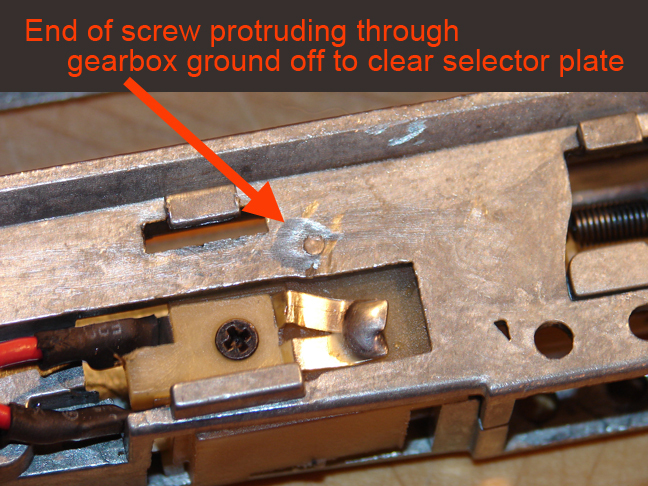 if i bridge the bottom pin against the selector plate contact, it runs. 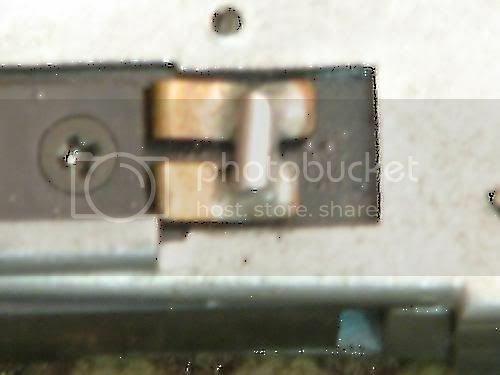 this is the first time i have tinkered with this type of selector plate, so is this normal or is that my issue? how have you soldered the mosfet up ???? ps - did you build your own mosfet or one off the shelf ??? The mosfet is a Gate Picco wired in the 2nd way, No obvious shorts. Its doing exactly the same with a new Non Mosfetted loom, which is making me think it may be a selector problem? Now trawling through a parts box i came across three different trigger styles, all for v2. Top is from an old G&G that never really had any issues, Middle is old and worn and third is the problem trigger. What is the reason for the three different styles and what do they do differently?